Dee and Sue Holladay "America's First Couple of River Running"
At an age when most couples might contemplate retirement, Dee and Sue Holladay spend roughly 100 days a year rafting the rivers of the West. But if you’re picturing a quiet weekend on a lazily drifting river that slowly winds its way through a series of oxbow bends and sedate countryside, you’ve only got half the picture. Dee and Sue like the Big Water, too, like that found on world-class whitewater rivers in Utah, Colorado and Idaho that challenge the most experienced river adventurers. It’s been the Holladays’ way of life for more than four decades and they wouldn’t trade it for anything. Even when they get a chance to take a break from their outfitting business, Holiday Expeditions, Inc., the Salt Lake City couple is likely to spend the time relaxing in the backcountry. Dee discovered he had river water running through his veins in 1960 when a friend invited him to tag along on a rafting trip on the Yampa River in Dinosaur National Monument on the Utah/Colorado border. 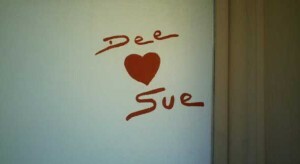 The next year Dee took Sue down the same river and she felt the same pull. In 1966, the couple felt they had enough experience to open their own rafting company. 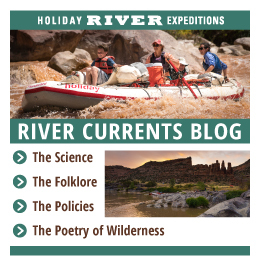 They named it Holiday River Expeditions, an easy-to-remember word play on their last name. That summer, Dee filled his weekends and vacation time from his job as a Salt Lake City auto mechanic with river trips. By 1973, the couple had enough business for Dee to quit his real job. Family matters didn’t interfere with the float trips, but rather became an integral part of them. Not long after their four daughters learned how to walk they learned how to run rivers with their parents. And ever since Dee and Sue launched their business, countless other families have discovered that float trips are a great vacation for the entire family. Today, the company, which added bike tours and changed its name to Holiday Expeditions in 1992, offers trips ranging from a one-day introduction to river running all the way up to a 12-day-long adventure through the Grand Canyon. Also available are multi-day mountain bike treks through Canyonlands National Park or Dinosaur National Monument, as well as combined river-bike trips. Once one understands the love the Holladays have for the rivers they run and the environment that surrounds them, it’s easy to understand their almost paternal approach to sharing the rivers with their guests. but also exploration and interpretation of Native American sites, geology and a century of river lore. Finally, the Holladays have held to an environmental ethic that rules out outboard engines on their trips and which stresses a “light on the land” credo. They were innovators or popularizers of such environmentally friendly techniques as building all campfires on elevated fire pans; hauling all wastes, including human, out of the backcountry; and educating their customers about how to minimize damage to fragile cryptobiotic soil critical to the survival of vegetation in the Southwest’s high desert landscapes. Such practices, say the Holladays, help ensure that the rivers and their ecosystems will be around for future generations to enjoy. “I guess you could say we’re kind of in the business of teaching our customers through awareness and appreciation about how to treat the wilderness,” says Sue.